With the amount of money that even role players have been getting deals for it's safe to say Smart and his agent Happy Walters will place his services at a premium price for the C's to lock up long term. Unfortunately for Marcus, the free wheeling spending may have dried up a season to soon for him. When the league's salary cap made a record jump before the 2016-17 season teams around the NBA were given some room to spend, but now, just a little over a year later, most teams have used up that extra space. After this coming season, when Smart finds himself entering free agency for the first time in his NBA career, there will be only a handful of teams that can offer him a contract in the range of what is generally assumed to be his value. Given that there will be more than a few big names ahead of him in the free agent class next offseason, it's not likely Smart will be the top name on any of those team's (that have money to spend) wish list. So what's the going rate for one of the most dynamic defenders in the NBA who's only 23 and could very well be on the cusp of a breakout season offensively? 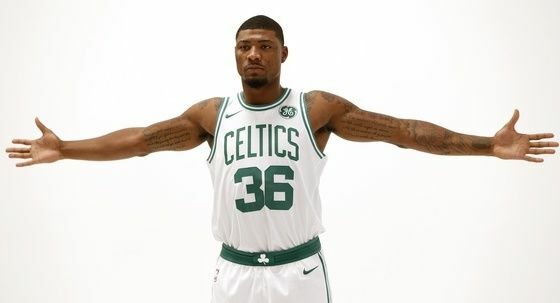 Marcus Smart extension talks w/Cs intriguing. I thought good template was Austin Rivers deal w/LAC last year (3/$35M). Smart seeking better. For a Marcus Smart extension, $14-$15 Million per year sounds about right to me. Less than Harris, more than Warren. No need to overpay. Aldridge is way out of touch if he thinks the Celtics are getting Marcus at Austin Rivers money. My guess is Smart is at minimum looking for $15 million a season; however, the Celtics hold a ton of leverage in any negotiations. Given the aforementioned limited number of potential Smart suitors next offseason coupled with his status as a restricted free agent when he hits the market the C's could simply just wait and see. They'd be able to match any offer sheet for Smart that's put in front of them, but they could very well screw themselves should Smart receive a monster off from one of those teams with money to spend. "It's important for you to get a good deal," Ainge said. "Whatever we do over the next few days has no bearing on our long-term plans for Marcus. It just might be more expensive come next summer or less expensive come next summer. We're both sort of rolling the dice." They way he's looked thus far, albeit preseason, he may very well be trending in that direction. Smart shot 58.3% from deep in 4 preseason games, and while that may be a small sample size it's on par with what we've heard all summer - that Marcus has made some serious strides in the shooting department. Combine that with him entering camp in the best shape of his life and you've got a very motivated individual who looks primed for a breakout season. I certainly wouldn't bet against somebody with the tenacity of Marcus Smart even if the odds aren't in his favor. I have a feeling that locking up Marcus for something like 4-years, $56 million will look like an absolute steal a year from now. Get it done Danny.